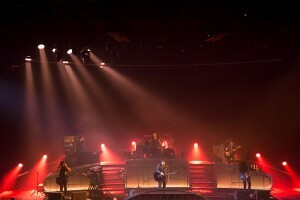 The historic Indochine tour, which will take place over two years, débuted at mid-sized venues in France in March. It has gradually become more and more impressive in size occupying ever more important concert locations and triumphing at the Stade de France. It is an original event lit by the staff of Concept-K, whose young Lighting Designer Thomas Déchandon put together an unusual lighting design with a special place for Clay Paky's A.Leda Wash K20s. Their LED rings are arranged in a circular array, which is a clear reference to the tour's visual impact and recalls the oval light on the poster. The project is entirely in keeping with the times and, at the Elispace in Beauvais, it merged Clay Paky's traditional features with its brand new washlights. The very special set of lights used was chosen from the Dushow stock for their visual effects, with the aim of putting the front scene into the background and picking out the large backdrop occupied by an array of LED spotlights. All the show’s energy comes from the side lighting, with 14 Alpha Profile 1500s, the proscenium, where 41 A.Leda Wash K20s hang from a circular structure to illuminate the audience, and the concentrated beams of 21 Sharpys on the back of the stage and on the floor. Videos are only used at the very beginning of the concert, when the famous beam lights shine intensely while the background is hidden by a curtain on which the images are projected. "This allows us to play with the transparency together with the Sharpys and obtain a nice surprise effect when the curtain drops," Thomas Déchandon explained. We were just as amazed when we discovered Clay Paky's latest creation, the A.Leda Wash K20s, which we chose for their individually controllable LEDs. When we compared them with their direct competitors, they came out on top thanks to their light output and enormous potential. "We were lucky enough to use them as soon as they came out," explained Thomas Déchandon, "and I use them both for their graphic functions (circles and starflash effect) and their wide coloured beam or wash. They provide a sound base with high light output, and you can play with their motorised zoom (8-40°) to achieve quite an interesting effect." 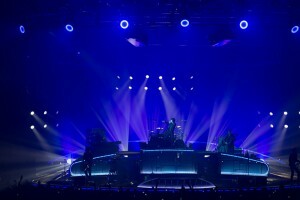 Nicolas Sirkis, Indochine's leader and singer, is entirely satisfied with the K20s used to light the audience with colour. Thomas chose this new generation LED washlight, "…not to fall back on the classic Molefays." A nice breath of fresh air!